Mama Love: Disney on Ice Passport to Adventure! 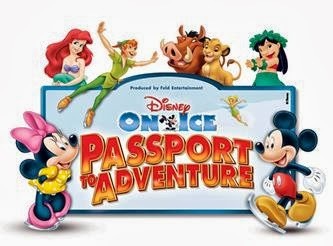 Disney on Ice Passport to Adventure! Good Buddy Notes Review and Giveaway!! Hurry there is still time to get your tickets for Disney On Ice presents Passport to Adventure, coming to Salt Lake City, November 6th- 10th! You don't want to miss out on this fantastic night full of magic and memories! Pack your bags and get ready to embark on the ultimate sightseeing adventure in Disney On Ice presents Passport to Adventure performing at EnergySolutions Arena from November 6 - 10. Join Mickey Mouse and Minnie Mouse as your tour guides on this magical getaway as they travel to four exciting Disney destinations all in one fun-filled ice production! Audiences will be transported straight from their seats into the enchanting worlds of Disney’s The Lion King, The Little Mermaid, Peter Pan and Lilo & Stitch in this sightseeing spectacular created for the entire family! Explore the Pride Lands with Simba, Timon and Pumbaa; voyage under the sea with Ariel and all her aquatic friends; tour jolly old London with Peter Pan and Tinker Bell, before flying to Never Land; and travel to Hawaii to visit Lilo and Stitch. Disney On Ice presents Passport to Adventure features an international team of award-winning figure skaters, high-energy choreography and a colorful set that captures all four unique worlds. Audiences will be entranced as they experience this exciting excursion—one that will fill the arena with magic, music, and best of all, Mickey and Minnie! All seats are reserved; tickets are available at the EnergySolutions Box Office, select Smith’s Grocery locations, charge by phone at 801-355-SEAT or 800-888-TIXX and online atwww.smithstix.com or www.energysolutionsarena.com.